Come be part of a refreshing hometown facility with big city capabilities within the beautiful surroundings of an old world Tuscany design. 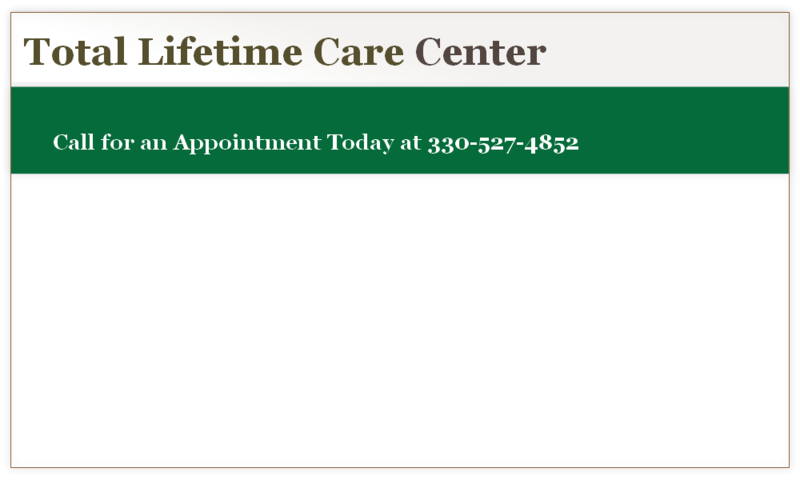 Total Lifetime Care Center complex is your conveniently located facility in Portage County that offers the entire spectrum of primary care, pediatric care, physical therapy, diagnostic testing, eye care and total fitness center in a caring, compassionate, and respectful environment. Our Philosophy: Wellness is more than the management of disease, but rather a continuum of maintaining body, mind and soul. At the Total Lifetime Care Center we hope to establish good habits and behaviors that will add to the richness of your daily lives. Our offices are environmentally friendly. Total Lifetime Care Center and Andrews Eye Care Center became one of the few practices in the country to start electronically recording and storing patient data in a “paperless” fashion. Our electronic medical records (EMR/EHR) helps our facility to become more efficient and more environmentally friendly by no longer utilizing paper products for most office functions. We feel this is an important contribution in helping to preserve our natural resources. All providers are currently accepting new patients and we are pleased to offer convenient early morning and evening hours by appointment. Sign up to receive Total Lifetime Care Center’s updates on new services, new features and much more.